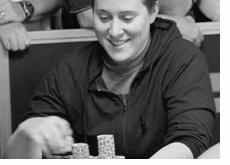 Vanessa Selbst has built on her recent hot streak by taking down the World Poker Tour Ladies (WPTL) Event at the L.A. Poker Classic. For her troubles, Selbst took down the first place prize of $26,500, besting Erica Schoenberg in heads-up play. Schoenberg received $15,000 for finishing in second place. Selbst has come close to winning in the past, but has never quite gone over the top until now. She recently finished in second place at the Battleship Poker event at the 2008 Pokerstars Caribbean Adventure, losing to Dustin "Neverwin" Woolf in heads-up play. She finished in third place at the WSOP No Limit Hold'em Heads Up event for $128k. Prior to that, she had three cashes at the World Series of Poker - a cash for 20k, 4800 and 101k. Selbst is an extremely smart and proficient poker player, having honed her game while attending school at MIT and Yale. Selbst now interns at a non-profit program in New York, and makes her income by playing poker.